It is state championship week! The 11-Man classes will crown their champions this weekend, while the state trophies were hoisted in Newton this past Saturday for both 8-Man classes. Kpreps has continued to post state rankings throughout the playoffs culminating in our final poll after all state champions are crowned. Let’s take a look at the Kpreps.com rankings for November 23rd. Check out our complete Rankings for further details. The Class 6A poll remains the same this week and our state title game is set. Top-ranked Derby will take on No. 2 Blue Valley in the 6A title game at Welch Stadium on the campus of Emporia State University. The Panthers defeated No. 4 Lawrence Free State 35-14 in the west semifinal, while the Tigers knocked out No. 3 Olathe North 43-19 in the east semifinal. Derby and Blue Valley survived one of the deepest 6A brackets we’ve seen in several years. In Class 5A, No. 1 Mill Valley reached the school’s first-ever state football title game by knocking off No. 3 St. Thomas Aquinas 45-28. The Jaguars will take on defending 5A champion Bishop Carroll on Saturday at Carnie Smith Stadium on the campus of Pittsburg State University. Carroll ended Goddard-Eisenhower’s playoff run with a 34-7 victory in the semifinals. In Class 4A-I, defending-champion Bishop Miege scored 52 consecutive points to beat Eudora 52-20 in one semifinal. The Stags will take on No. 2 Andover Central in the state title game in Topeka. The Jaguars dominated No. 3 Topeka Hayden 28-2 in the semifinals to reach the schools’ first-ever football title game. 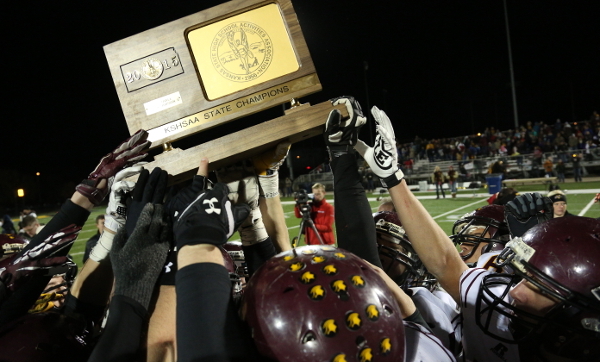 Buhler and Abilene round out this week’s top five. The Holcomb Longhorns are the new No. 1 team in 4A-II as they knocked off defending champion Andale, 26-13. Holcomb will take on Holton in the state title game in Salina. The Wildcats scored a touchdown and two-point conversion with 31 seconds remaining to knock off then No. 1 Columbus, 23-22. Columbus comes in at No. 3 in this week’s poll, while Andale is ranked fourth. In Class 3A, top-ranked Rossville reached a second straight title game with a 49-0 blowout over Wellsville. The Bulldawgs will take on No. 2 Wichita Collegiate in the 3A title game in Hutchinson. Collegiate shut out No. 3 Halstead 21-0 in the semifinals to reach the final round. The Class 2-1A championship will feature two schools making their first appearance in a football title game. Top-ranked Phillipsburg will take on No. 2 Troy at Lewis Field on the campus of Fort Hays State University. Phillipsburg beat Smith Center for a second time this season using a big second half to pull away 40-6. Troy ensured there would be a new champion in Class 2-1A as the Trojans held off Olpe, 30-21. The remainder of this week’s poll features Meade at No. 3, Smith Center at No. 4, and Olpe ranked fifth. Congratulations to the Spearville Royal Lancers and the Victoria Knights for capturing state championships in the eight-man classes on Saturday in Newton. Spearville defeated Hanover 62-16 in the 8-Man, Division I game to finish atop the 8M-I poll. Victoria topped Argonia-Attica 36-28 in dramatic fashion as Brady Dinkel raced 56 yards for a touchdown with two seconds remaining in the game.